Glastonbury Festival organisers are planning to mark its 40th anniversary next year by booking 40 bands from the past 40 years to play the 2010 event. 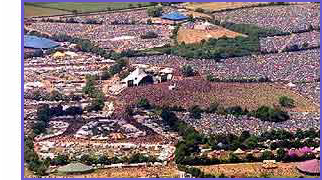 Michael Eavis founded the event in 1970 on his dairy farm near Pilton, Somerset. Daughter Emily said they were planning a celebration next year. "We want to have a band from every year on the Pyramid Stage," she said. "We'll have a lot of the biggest performances on some of the tiniest stages," she told BBC 6 Music. Ms Eavis also revealed that 2009's festival, which takes place from 24-28 June, will not feature its famous Left Field area, which played host to artists such as Kate Nash, Reverend And The Makers, The Automatic and Billy Bragg last year. But she said fans would not be disappointed with other areas enlarged. "Trash City, which was a real hit, is going to be expanded and it's going to spill into Shangri La," she said. "That whole area is going to be like a late-night den with snake pits and all sorts." Bruce Springsteen and Blur have been officially confirmed as headliners, but the full line-up announcement will not be made until May or June. Ms Eavis said: "We have got the best possible line-up that we could get this year. I think Jay-Z, we've got a lot to thank him for, because we've never had so many bands wanting to play." This page was generated in 0.2852 seconds.